How does one go about creating a custom frame that perfectly complements a treasured American artifact? When it comes to custom picture frames, the expertise lies in crafting a frame that strikes the perfect balance between showcasing the art and customizing the piece for its display environment. 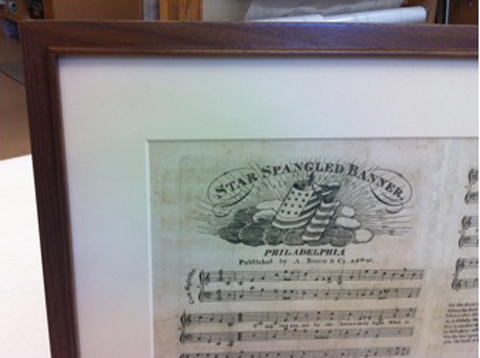 One of our clients brought us one of the early copies of the Star Spangled Banner and wanted us to create a custom frame for it. Some would assume a treasured artifact of this caliber deserves a large, gilded frame. But after considering the options, our client took a different approach: they chose a simple frame using mahogany reminiscent of the era, allowing the object to speak for itself. 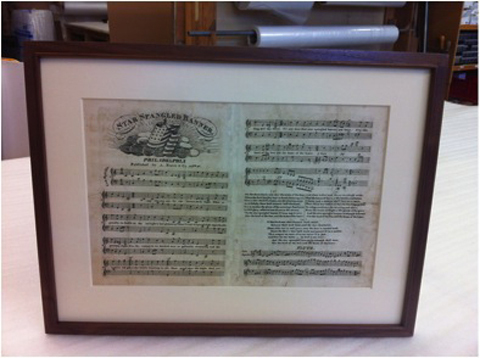 This printing of the Star Spangled Banner dates back to 1815; one year after the song was composed and originally published. Printed in Philadelphia, by A. Bacon and Co, this is an early copy and incredibly rare. Only 11 known copies of the original first edition copies exist, and although this was not one of them, it maintains comparable cultural significance. During their publication, these documents weren’t meant to be kept as heirlooms. They were printed for the general public, who purchased them, sometimes in booklets, to use at home around the family piano. This client chose a wood frame and finish that could not be simpler. It is a solid mahogany frame, with a natural finish. And due to the importance and value placed on mahogany during the time period, it really works. In the early 1800s, it would have been unlikely that anyone but the wealthy had access to mahogany. The exotic wood, imported from the West Indies including Jamaica, and from Central America, was most fashionable at the time; George Washington presided over the Continental Congress while seated in a Chippendale mahogany chair. The mahogany used by A Street Frames is Forest Stewardship Council (FSC) certified, which guarantees responsible harvesting of the wood from sustainable sources. In this case, the safest method was to use Japanese rice paper hinges to hold the sheet at the top. This process is archival, and completely reversible, without threat of permanent damage to the piece. All of the paper mat board is also archival. The glass filters well over 90% of UV light, and is also coated with an anti-reflective layer, to reduce glare. Short of putting this object in a sealed, humidity-controlled case, this method is perfectly safe, and will keep the document from fading, or suffering any damage. When it comes to custom framing, nobody performs the delicate, sophisticated process of creating custom picture frames like A Street Frames. With a wealth of experience and the highest quality custom framing process, we will craft a frame to work with your object and allow it to show its true colors.